An unusual, kiosk-looking wood structure that appeared on the School of Architecture courtyard after winter break is actually a semester’s worth of work for one design and build studio class taught by Rocco Ceo and James Adamson. The 14-foot structure was designed and built by 13 undergraduate and graduate architecture students during fall 2014. Named The Billy Goat after goats that discovered coffee beans in ancient Ethiopia, it will officially open within the next two weeks. Unlike previous assignments given to the studio class, this project was created for UM to serve as a closer option for architecture students to get coffee while working late. According to Lauren O’Halloran, a fifth-year architecture student, the class got no instruction beyond the fact that they needed to build a coffee kiosk and it needed to fit in the specific site they were given. According to O’Halloran, however, getting 13 artists to agree on one design was no simple undertaking in the beginning stages of the process. “At one point, the studio was divided between two designs. We really pursued each of those separately and then we presented them,” O’Halloran said. By creating small-scale models of each of the ideas, the class was able to identify the flaws in each design and work to make a stronger version. “We were all expected to be a part of everything. Everybody was supposed to work on the drawings and everybody had to build it,” O’Halloran said. 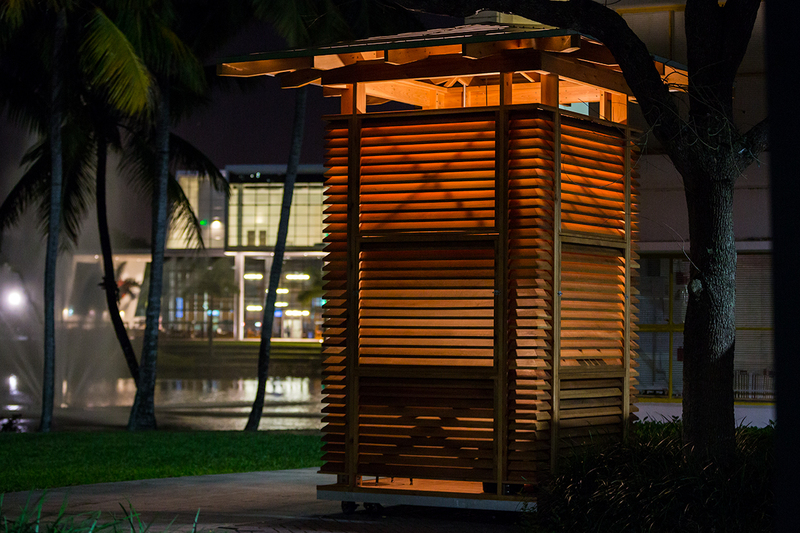 In the past, the design and build studio class designed a bathroom for a park, eco-tents for the Everglades and an outdoor seating pavilion for companies that commissioned them. The coffee kiosk is the first project to be by the students, for the students. Emma May is a graduate student who worked on the kiosk project. When Professor Rocco Ceo informed the class of their semester-long assignment, May was pleased. “We were kind of relieved, because we’d been designing proposals for cafes for the School of Architecture … but they never get built,” May said. For May, the project went beyond fall semester. She will run the kiosk for the time being, serving free coffee to weary students in exchange for donations. Armando Montero, a professor in the School of Architecture, has a startup specialty coffee business called Montero Coffee. He offered to provide an espresso machine and sell specialty-grade organic coffee at a discount to the kiosk buyers. However, the details are still being finalized, according to Montero.